How do artists communicate concepts of science through the arts? With its emphasis on S.T.E.A.M-based education, the Everhart Museum and AIE NEPA are proud to present The Science of Art, a brand new Artist in Residence program devoted to exploring how science connects with the arts. 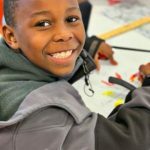 During each session, students will work with a team of educators and rostered artists to create a work of art inspired by the Everhart Museum collection incorporating an element of science or technology based on a specific theme.